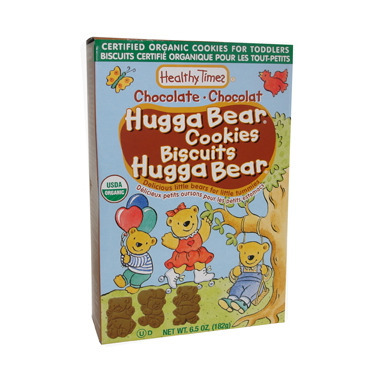 Premium Organic Hugga Bear Cookies were specially created for your growing toddler. Hugga Bear Cookies are just the right size for little hands to hold. Try all four varieties: Vanilla, Honey Graham, Cinnamon, and Chocolate. They are a good source of calcium and zinc for your child's healthy growth and development. INGREDIENTS: Organic Whole Wheat Flour, Organic Evaporated Unrefined Cane Juice, Organic Cold Pressed Safflower Oil and/or Organic Sunflower Oil, Organic Honey, Organic Cocoa, Aluminum Free Baking Soda, Organic Unsweetened Chocolate, Natural Flavor. Produced in a facility that uses milk, eggs, peanuts and tree nuts. My daughter has been snacking on these since she was about 18 months and she loves them (I do too!) I feel good about giving them to her as a treat, they are not too sweet either. My toddler loves these chocolate cookies. These are a great product with only 6 grams of sugar per 7 cookies. They make a great incentive for potty training and taste great. This company has gone the extra mile to provide a very yummy organic option. I could eat the whole box they are so addicting! My 15 month old is loving these for a snack! My granddaughter loves these. Very Healthy snack. Thanks for the super quick shipping. What a wonderful product! Very few ingredients, and the ones that are listed are healthy. I feel very good about feeding these cookies as a snack to my 15 month old daughter.